The number 164 is a composite number. It has 6 factors: 1, 2, 4, 41, 82 and 164. Sum of the divisors is 294. In number theory, 164 gets a little bit more interesting. It is a solution to the Mertens function M(x). Less formally, this function is the count of square-free integers up to x that have an even number of prime factors, minus the count of those that have an odd number. A square-free integer is an integer that cannot be divided by any perfect square other than 1. Also, the Mertens function is closely related to the Möbius function μ(n) – an important function in Number Theory and Combinatorics, that has interesting applications in physics. Let the games start! Enjoy every article and have fun finding out more interesting things about mathematics! I hope you have a hot chocolate cup in your hand and maybe some Christmas tunes – everything ready to dive in some very interesting mathematics. We will start our journey with a dive into the past with this simple question: did you know that in the 1830s maths students rebelled against new educational technology? In Degenerates – the Conic Sections Rebellion(s), Lucy Rycroft-Smith shows us that the history of education can tell us a lot about our current educational system. It is interesting to observe that students’ reactions are similar then as they are now, especially related to specific aspects of change. Moreover, the article offers some interesting opinions about the use of “textbooks” in maths’ classes. First practical activity of the carnival is here: A Puzzle about Representing Numbers as a Sum of 3 – smooth Numbers. I hope you have your favourite pen or pencil ready, take some squared paper and be ready to go deep into some friendly and interesting piece of recreational mathematics. Enjoy! The next ride takes us back to the 1800s. In Tuning a Typewriter, we get to read an awesome “maths activity” to try and understand and optimize the typewriter’s key layout. It is a challenging and interesting question. Moreover, the question is left as an open problem, so you can give it a go and figure out an optimal arrangement for the typewriter. Enjoy! Next attraction takes us to Matlab. In Approximate Pi: Matlab Monte-Carlo Method, we take a look at how it is possible to efficiently implement great ideas that are practically impossible in a program and calculate pi by throwing 1’000’000’000 darts at the unit ball. This article provides the program for us to try for ourselves, which is a wonderful idea. Hope you have your Matlab open and you are ready to play with the program and find out more about pi. Are you ready for another open problem? For the next ride we have Counting Paths to Polyhedra. The aim of the article is to find a way to count the number of paths of length n between two vertices of a dodecahedron. 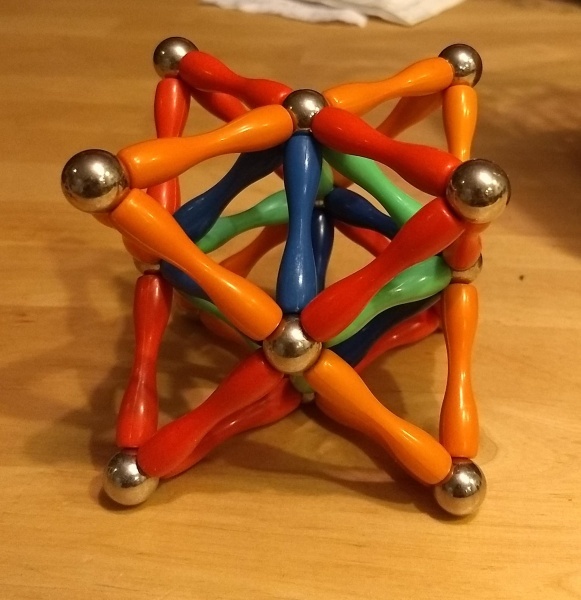 The method used there works for tetrahedra and cubes, but it needs some improvement for the dodecahedron. Take your hot chocolate, some pen and paper and see if you can solve the problem, but more importantly enjoy the process! Moving on to a perfect Carnival attraction: Stacking Cups and Bunny Rabbits. This article presents an interesting talk by Christian Lawson – “Perfect about stacking cups”. You can see a really quick version of his talk on the Aperiodical website. The article offers us an inside into the talk and the mathematics behind it. Moreover, if you are a big fan of the Fibonacci sequence I totally recommend you take a paper and a pencil and try the activity by yourself. Have you ever heard of a Carnival of Mathematics that after mentioning the famous pi and the Fibonacci sequence, doesn’t have an attraction for all those prime numbers fans out there? Of course not… and Prime Interruption is the perfect fit. This article presents an interesting concept in a short easy to understand manner. If you didn’t know, given any initial sequence of digits, you can always add more digits to create a prime number. Let us get a little chaotic with this next attraction: Chaos and the Double Pendulum. Have you ever wanted to know what “chaos” means from a mathematical point of view? Or maybe you have no idea what is the connection between a double pendulum and chaos? Well, this is the article for you. If you are a connoisseur of these concepts, you still need to read this – even just for the nice appearance of a Lissajous curve when small disturbance is applied to a double pendulum! After so many hard – core, pen and paper or technological activities, it’s time for a more relaxed, practical one: How do you make a stella octangula? The article doesn’t need more presentation because we all love Stella Octangula and creating one is such a relaxing activity. We are ending this edition of the Carnival with another historical attraction: Alan Turing: visionary, war hero and the only choice for the £50 note. To give you a little bit of background, the Bank of England has decided that the next prominent figure to feature on the £50 note should be a scientist and have put the call out for nominations from the general public. As the title suggests, this article has an incredible submission: Alan Turing. What do you think? Is he the right choice? This issue we had a lot of interesting attractions, ranging from historical aspects, such as Alan Turing and the Conic Sections Rebellion, to modern mathematical concepts, such as Chaos Theory. We have pi, Fibonacci sequence and prime numbers. Moreover, we have some interesting open problems for anyone to try! Hope you all had fun and we thank you all for the participation!